Stuffed burgers are all the rage these days. This is the recipe I keep up my sleeve for the times when I want to spoil the pants off a burger lover. There’s really no other justification for a half-pound ground beef and bacon patty stuffed with melted cheese. If you’ve got a bacon fiend on your hands, give them bacon in every bite. Quit pretending it’s “good enough” to throw a couple pieces of bacon on top of the patty and put it instead inside the patty. Cook and crumble or chop the strips, then include the bits when you mix everything up to form the patty. 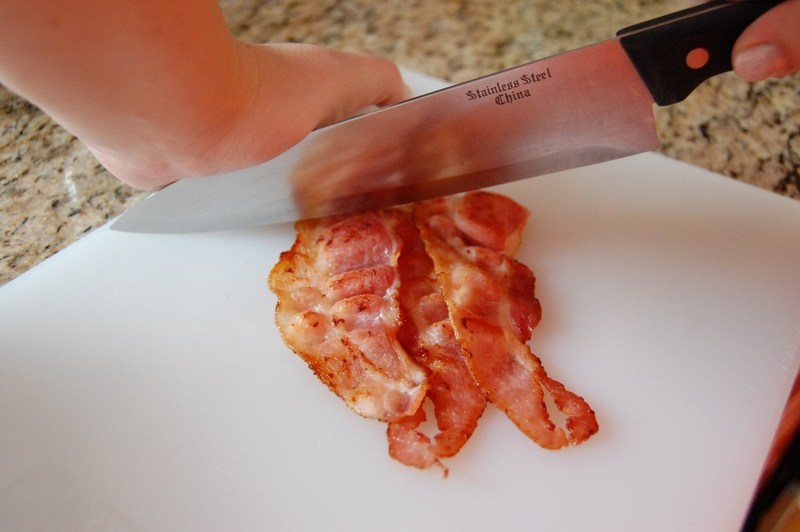 I picked up this little trick years ago from a bacon-crazed buddy of mine. I don’t add breadcrumbs to my burgers. Sue me. Fit the cheese into a divot in the bottom half of what will be a half-pound patty. I happened to have pepper jack in the cheese drawer, so I used that and decided to top it all with guacamole, salsa, and pickled jalapeños. 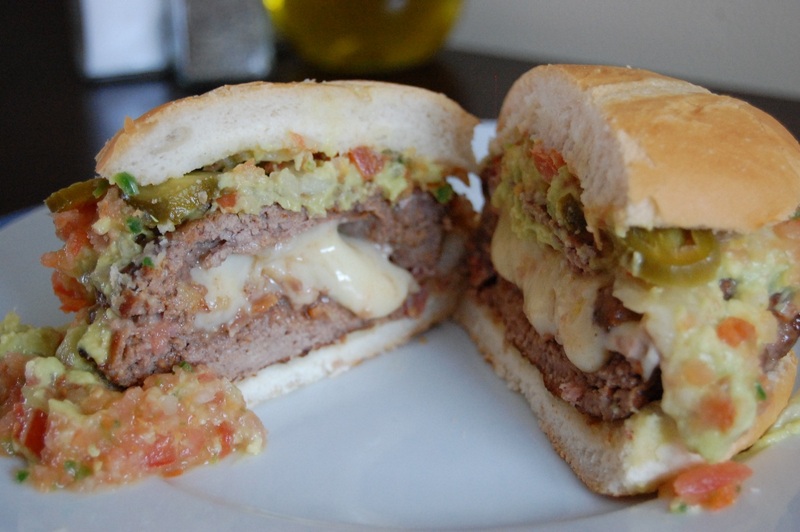 You, of course, can use whatever cheese and toppings you like best on your burger! Forget the pan and use your broiler to make an indoor burger. Mark my words: I will never post a “stove top” burger recipe here. When you are banished from your outdoor grill by Old Man Winter, your broiler will step in to console you with flame-kissed beef. Regardless of cooking method, here’s a burger tip you should live by: Do Not Smash Your Burger With a Spatula. I know that the sizzling sound is almost unbearably irresistible, but you’re enjoying that sound at the expense of flavor when you force all those juices out of the burger. Oozing cheese. Pretty sure I needn’t say more. 1. 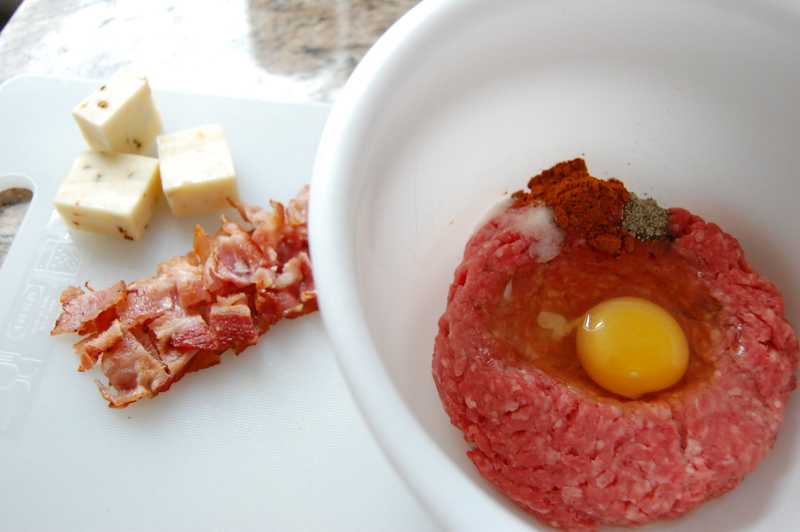 In large bowl, add ground beef, egg, chopped bacon, salt, pepper, paprika, and garlic powder. Mix with hands until blended, but take care not to “over handle” the contents or the burgers will be too dense. Form 4 patties. 2. Use thumb to press a divot into 2 of the patties. Place two cubes of cheese in the divots and then cover with remaining patties. Gentle press edges together until well sealed. 3. Move rack to top position in oven and set to broil. Place patties on baking sheet and broil for approximately 5 – 8 minutes. 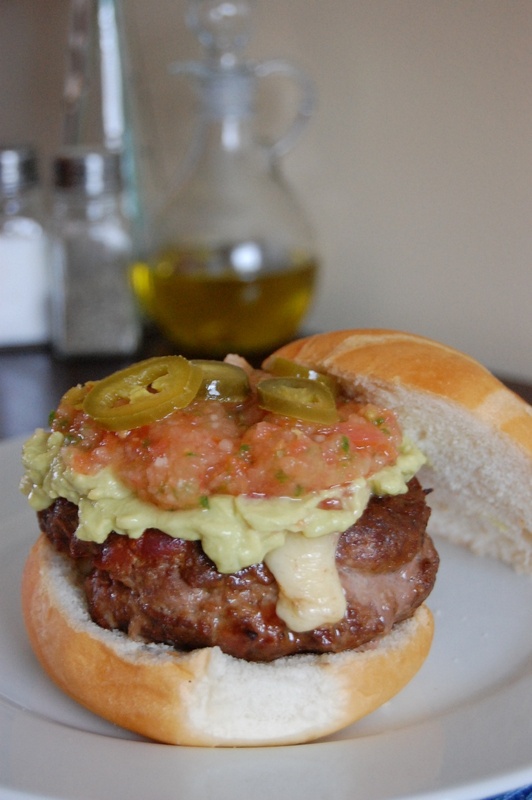 Flip burgers over and broil and additional 5 – 8 minutes, or until done. Serve with desired toppings. This entry was posted in Beef, Dinner, Meat and tagged Beef, Broil, Burger, Cook Time, Cooking, Easy, Prep Time, Quick, Recipes, Simple, Yield by Lazy Suzan. Bookmark the permalink. Wow I may have to try these next time I make dinner for my boyfriend. He’s a bit of a burger and bacon fanatic so I’m sure he’ll love these. It’s a nifty little trick. Let me know what you guys think! 🙂 Thanks for stopping by! Thank you! 🙂 And thanks for stopping by. Oh yes, bacon and burgers! a favorite of mine! I want that, like, right now! : ) Thanks for stopping by and commenting! 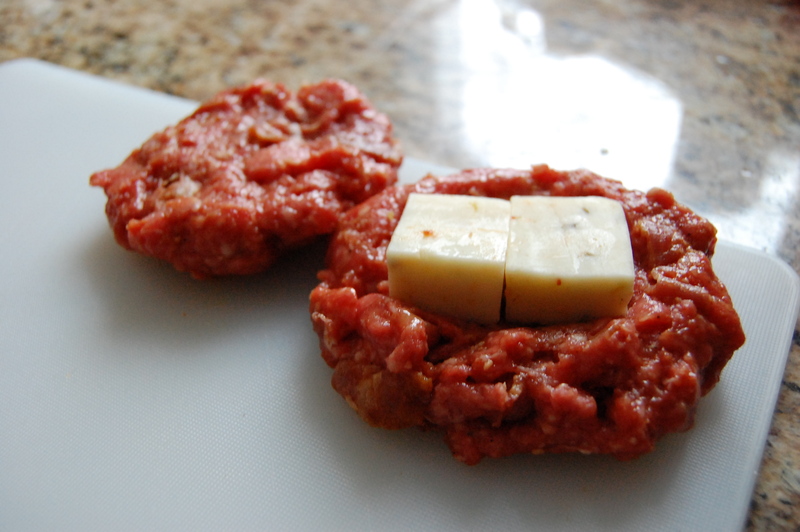 For years we have added cheese pieces to the raw meat as it is being mixed with the balance of the ingredients making the entire burger (preferably wild game or buffalo meat) cheesy. Great recipe. My mouth waters. Thanks for the like! Hate you! I gained five pounds just looking at the pictures! Never darken my dialogondialogue door again! No, seriously, stop by anytime. Just don’t leave and burgers in my comment box. Great looking burger! I seem to be collecting burger recipes these days (not such a good idea after the holidays). These look delicious.